One of our Community Groups, led by Eric and Ashlee Fuchs, thought of an ingenious way to help the less fortunate in our city: a place where people could put everyday necessities so that anyone, at any time, who needed these items could come and grab what they need. Thus the idea of the "Blessing Box" was born. It went through several less-sturdy iterations before it is the tough-metal-cabinet-fastened-to-our-brick-wall that it is today, but it has been an incredible help to people in our city for the last couple of years. 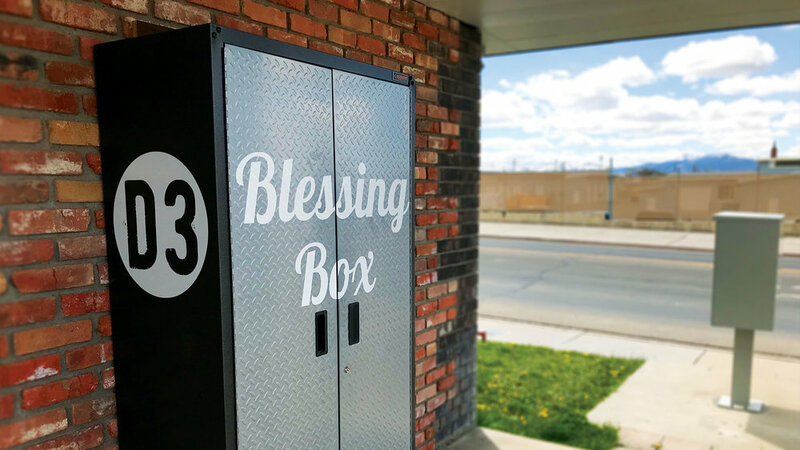 A project like the Blessing Box takes a WHOLE COMMUNITY to keep it stocked. It has been utilized by the needy in our community WAY more than we thought, and it is difficult to keep it stocked. So, below are some items that you can purchase or donate to keep it full of items that people could use. IMPORTANT NOTES: Please keep the quality of the items in the box high. We don't want it to be full of junk. If it's toiletries or food items, please make sure it's clean, fresh, and unused. If you have clothes you're not sure if they're really wearable or not, please take them to a local thrift store instead, as we do not have staff to sift through it. Also, please never put bags or boxes of things outside the blessing box. If there is no room inside, wait until there is more room, or again, take it to another donation drop-off location in town. Thanks for helping keep the Blessing Box clean and useful!